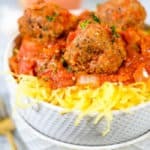 These Paleo, Whole30 + Keto baked turkey meatballs are the perfect meal prep recipe or easy dinner. Enjoy the leftovers for breakfast or lunch during the work week. 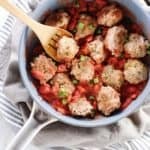 These healthy meatballs are sure to be a family favorite you will make again and again! 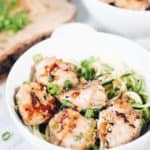 Our goal is always to use the least ingredients to get the maximum flavor and to show you guys that cooking and eating well don’t have to be complicated! 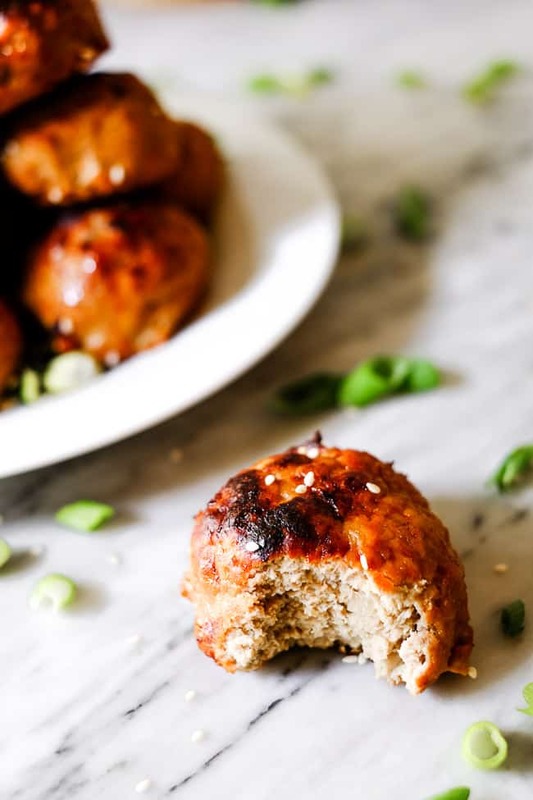 These baked turkey meatballs are a great showcase of both of those goals. 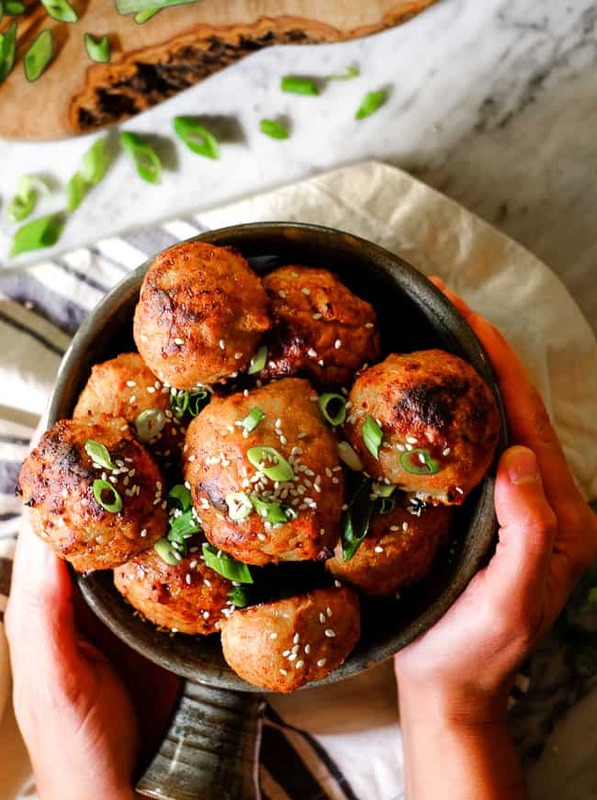 With under 10 ingredients (most of which are seasonings you probably have on hand), these meatballs are simple, yet packed with flavor. 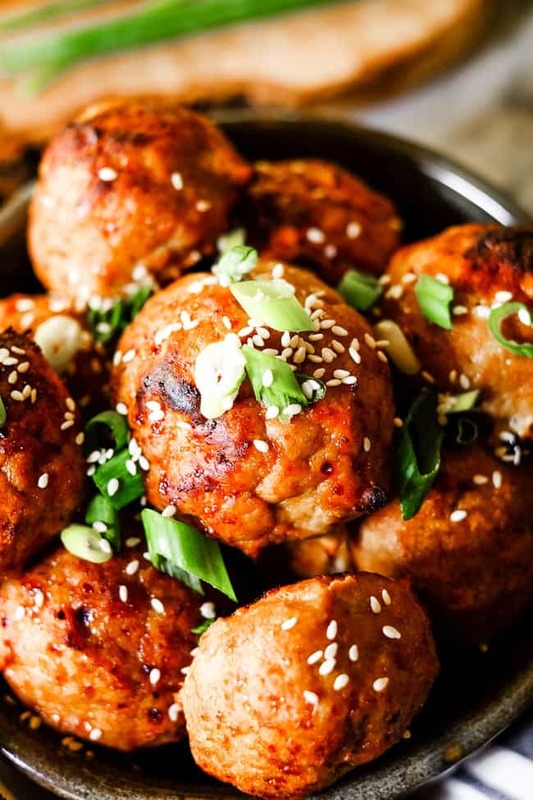 And….all you have to do is get your hands a little dirty to mix up all the ingredients and roll them into balls. Hands down the best way to make sure eating well during the work week is easy, is to do a little meal planning and prep over the weekend. We recommend prepping a larger meal, breakfast and a snack over the weekend. And if you’re like me and have a sweet tooth, sometimes prepping a treat is good too, just so a healthier option is readily available when the craving hits. 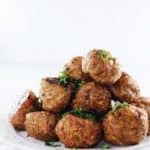 These baked turkey meatballs are a great make ahead meal because you can make a bunch of meatballs and store them in the fridge or freezer for easy re-heating. 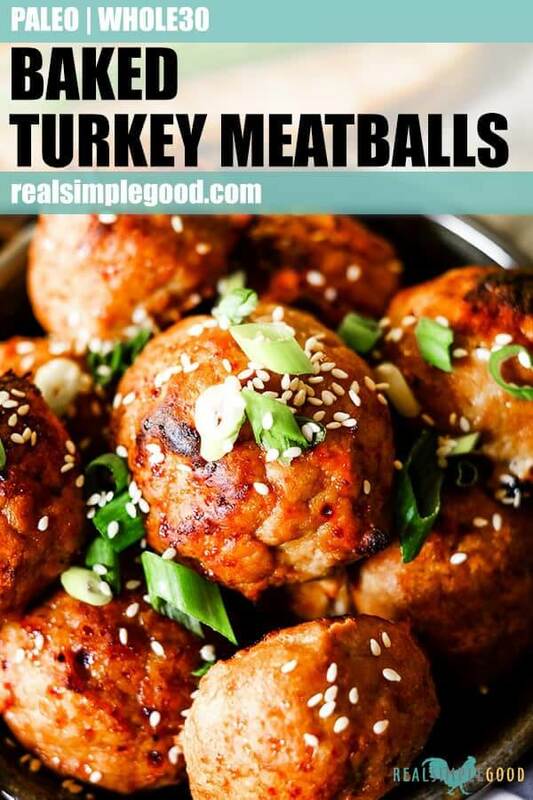 Once you’ve meal prepped these baked turkey meatballs, all you have to do is re-heat them. You can pair them with just about anything – greens, your favorite roasted, raw or grilled veggies, eggs, etc. And changing what you eat them with makes your meals feel a little different each time, which is great for those of you who crave variety! 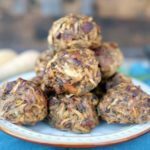 They really are versatile and can serve as the protein for your breakfast, lunch or dinner. 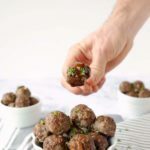 You can even just have a meatball or two for a quick snack! 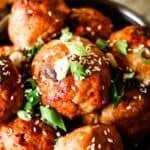 Plan to make these baked turkey meatballs this coming weekend! You’ll enjoy the ease of just having to re-heat them for breakfast, lunch or dinner during the work week! Leave a comment below and let us know how it goes. Also, take a pic to share on Instagram! We love seeing what you guys make! Tag us @realsimplegood, and give us a follow if you don’t already! We’d love to stay connected and also make sure you see all of our behind the scenes story posts on Instagram as well the fun giveaways we do as well. 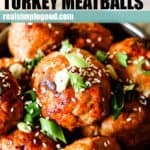 These Paleo, Whole30 + Keto baked turkey meatballs are a healthy meatball recipe, easy dinner and are sure to be a family favorite! Preheat oven to 400° Fahrenheit and line a large sheet pan with parchment paper. Prep shallot and ginger as noted and place all of the ingredients (except toppings) in a large bowl. Mix everything together well with your hands until well incorporated. Now, form the turkey into small balls about the size of a heaping tablespoon. You can use a small ice cream scoop if you have one, it makes it easy to form the turkey into balls without everything sticking to your hands. This should yield about 25 meatballs. Place in the oven to cook for 20 minutes. Remove from oven and sprinkle on toppings as desired. Serve and enjoy. 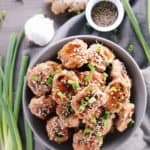 Just made these tonight, and they were delicious. 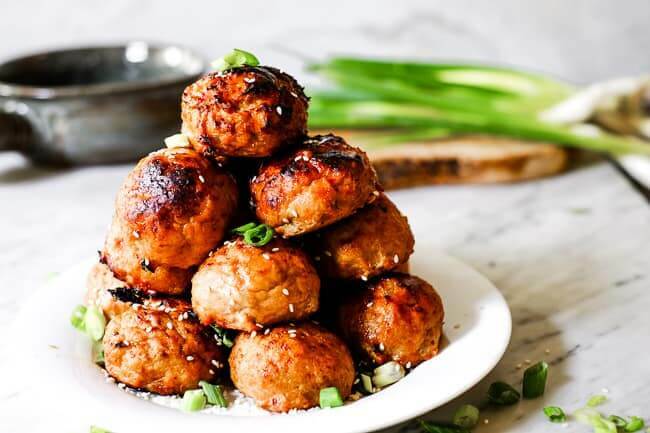 Had them with a side salad, but I think they would be delicious with some cauli rice too! Thanks for the recipe! So glad you liked the recipe :). O. M. G. These are amazing! 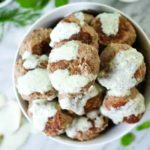 So easy to make and taste so delicious!!! 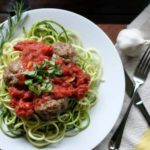 I served them on a bed of zucchini noodles with sliced bell peppers and grated carrots cooked to soften with toasted sesame oil, garlic powder and ginger! So excited to have an easy go to dinner for busy work days. Thank you both for creating something so easy and quick it makes eating healthier so much easier.